January's sponsors have been ever so lovely to offer a ton of giveaways that I've divided up into two groups. One lucky winner will receive all of the items in this post if their name is picked from the comments section. Another lucky winner will be picked from the second group! Please stop by and see what my January sponsors are up to in their shops and blogs. They make so many good things possible over here at Smile and Wave! "Hi! My name is Stacie. 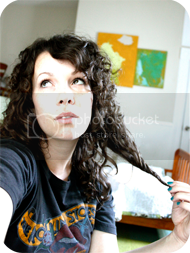 I run an online print shop called Gingiber and a purty little blog called Gingibersnap. 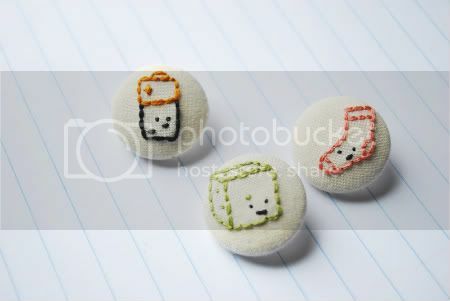 I specialize in quirky little doodles and handmade gifts for momma and kiddos alike. My art is inspired by my childhood experiences and memories. 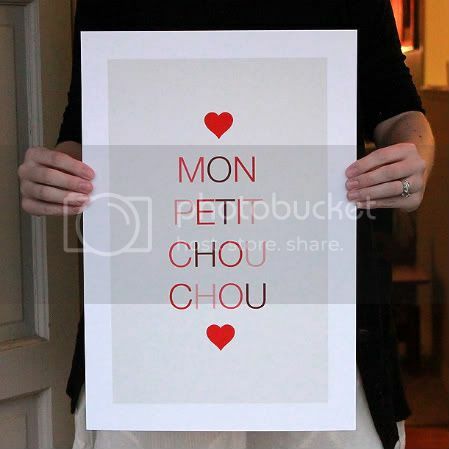 For example, my new Valentine's Day print "Mon Petit Chou Chou", is a french phrase that I learned in the 1st grade. It literally translates to "My Little Cabbage". It is a term of endearment, and I loved secretly calling all of my friends and loved ones cabbages. Now that you know what Mon Petit Chou Chou means, I challenge you to let all of the little cabbage in your life know how much you love them. I'm giving away to one reader an Mon Petit Chou Chou Poster. 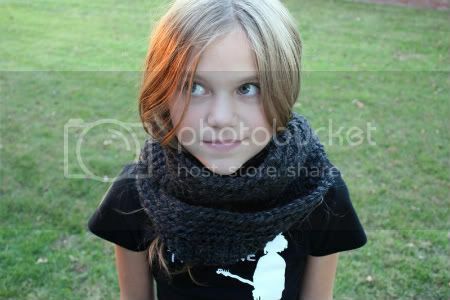 I learned to crochet when my daughter was born 11 years ago. My grandma taught me- over the phone! I am a web consultant/ photographer by day, and at night when all the kids are in bed, I spend my time whipping up hats and scarves. I love using huge crochet hooks and really chunky yarn! I also like to try all kinds of fibers- acrylic, wool, cotton, bamboo... and soon I'll be offering items made with hand spun yarns. Rachel is generously offering $50 shop credit! Hey! 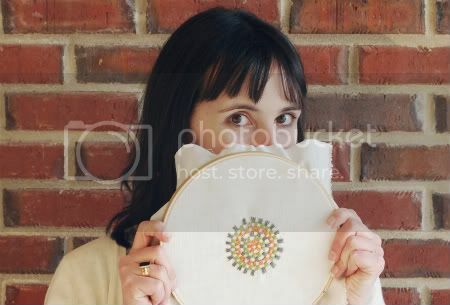 I'm Mollie from Wild Olive, and my favorite things are embroidery, cute things with faces, and putting those two together. 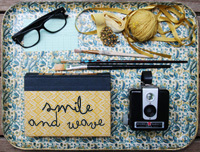 On my blog I love sharing patterns, printables, and other fun stuff that I make, do and create! 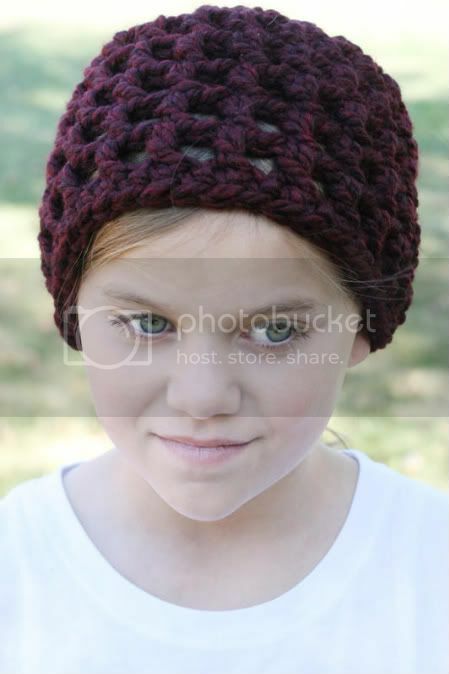 I'm giving away a 2011 membership to my Pattern of the Month Club. Each month members receive a new set of embroidery patterns along with a mini-newsletter. To enter to win share your favorite seasonal drink in the comments below! Giveaway open to U.S. and Canada residents only. Comments open until Monday, January 31st. Please leave a way to contact you in case you are the lucky winner! I love a warm cup of irish coffee when it's cold out! I love a good pumpkin spice latte from Starbucks. Or Braum's hot chocolate! hot wassail is my favorite. the version with brandy of course. My favorite seasonal drink is a steaming cup of fennel tea with honey - warms me right up and tastes delicious! My favorite seasonal drink is hot cocoa with marshmallows. Hmmm... my favorite winter beverage... I'm not much of a hot drink person, so I'd have to say cranberry juice! For me, it is definitely hot chocolate! Great giveaway! 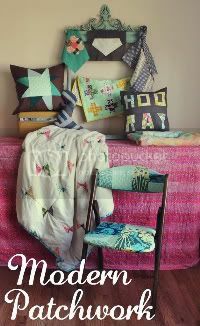 Love the crochet, the needlepoint and the wonderful prints. Yum! I love Blueberry flavored coffee. YUM! Whyyyy are all of your sponsors so adorable? 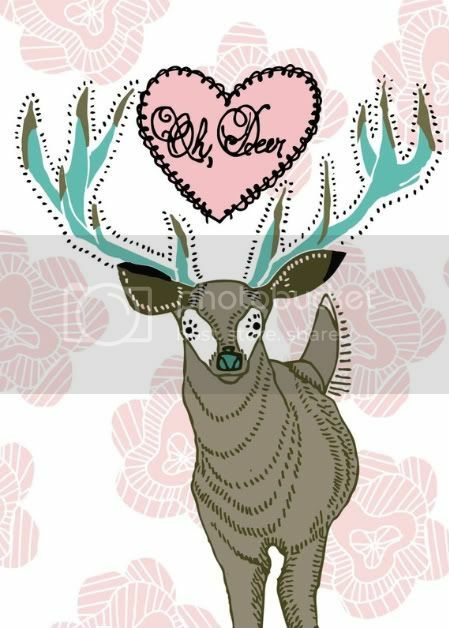 Loving the :cute things with faces" quote. My favorite winter drink is Berry Creme black tea from my favorite West Village tea shop, McNulty's. It's so good that it's almost unfair to all other beverages. Vanilla Spice tea with cream and honey, apple cider with cinnamon hard candy at the bottom, and Snowshoes (peppermint Schnapps and Wild Turkey). mmmm when it's cold outside i love hazelnut flavored lattes! And when it's hot hot hot, I'm a iced soy latte girl...or if I'm feeling naughty a java chip frap with peppermint and whip, yummo!!!! mmmm, gingerbread latte. as lovely as this ridiculously amazing giveaway. I use to like tea when I was younger but not so much anymore. I love fun summer drinks- I am always on the lookout for the perfect mixture. One that we like is mixing ginger ale, orange juice, pineapple juice, and topping it with rainbow sherbert...yum. my favorite drink belongs in the season of summer....homemade lemonade, with seltzer. It's not seasonal...but vanilla soy chai tea lattes are my favorite. I love drinking brandy alexanders this time of year...which I am really missing since being pregnant!! AHH! I love this combo of sponsers! I just made homemade spicy hot choco last night.. used the immersion blender to 'foam' the milk- DELISH. I LOVE dark, dark hot chocolate that's not very sweet with lots of marshmallows on top! Oh, definitely a salted carmel hot chocolate. I had it first at Starbucks, but they're really easy to make at home. Just spray some whipped cream on your hot chocolate, spoon on some carmel ice cream topping, and sprinkle a couple shakes of salt on top. Yummy! Pretty pretties! I'm a fan of fresh strawberry lemonade, with real strawberries crushed and mixed in! just a cup of hot tea makes any day so much cozier. hot toddies are fun too. what a lovely giveaway! For the cold winter months, I love huge cups of coffee, black with just a little but of sugar. Nothing makes me warmer or happier. Egg Nog lattes! So yummy!!! Chai tea! My favorite after a long day snuggling up to my husband watching a movie. 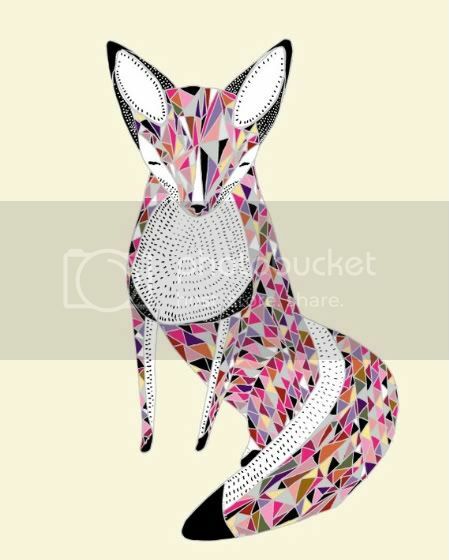 I love love the picture of the fox. My favorite seasonal drink is hot chocolate with bourbon, chili powder, and whole milk, whipped frothy on the stove. there is nothing like a cold glass of southern sweet tea. one of my favorite things about living in the south! My seasonal drink is chai tea with soy :) but I like it in the summer as well...on ice! I love caramel spiced tea to keep me warm during the winter! i love sweet tea! I cannot get enough of it! Definitely a Snowball at Christmas. Loads of variations but my fave is Warninks Advocat, Gordon's Gin, dash of Lime cordial and topped up with plenty offizzy lemonade until fantastically frothy. Nom nom. Chin chin! i remember how tickled I was when I learned "mon petit chou chou" in French class. It's so cute! I LOVE fresh lemonade! lovelove! Apple cider is my favorite as far as seasonal goes. I never really buy it outside of the Winter months, but I enjoy it a ton during that small span of time. i love ginger ale but for some reason only drink it around christmas or when i am on an airplane! i guess i like to keep it special. A hot cuppa pumpkin spice latte coffee made in my crockpot. YUM! I love limeade in the summer... tart and sweet and perfect for picnics! seasonal drink... hot chocolate? is that seasonal if I can drink it whenever? :) that's the only warm drink and one of the few drinks I like (some juices, water, hot coffee, iced tea). Mostly it's just water. I even hate milk and all sodas!! I'm in love with india spice chai tea with a little cream and a little sugar. Delish. wow-you have such great giveaways! My favorite winter drink is a salted caramel hot chocolate :) It instantly makes me feel warm! I know that people drink Chai all year long, but it tastes like Christmas to me. It is my favorite treat on cold, blustery days! Nothing beats a cup of tea! Yum! Thank you so much for hosting these giveaways! My favorite seasonal drink is hot chocolate, and it's become even more exciting this year, as we did a big basket exchange with a couple other couples and in our basket was about 20 packs of different flavored hot chocolate, like chocolate graham cracker and artic white chocolate... both of which were AMAZINGLY delicious. I love hot tea. I drink it all day long. I loooove hot chocolate...even when it's NOT cold outside! Spiced cider in the wintertime is the best! I like making steamed milk on the stovetop and then adding a little bit of maple syrup and whisking it in a whole bunch to make it frothy. So good! hot apple cider with caramel. mmmmm! also love pumpkin spice lattes from starbucks. fall drinks are the best! Definitely a big cup of tea. There is nothing like it. Fun giveaway! I would have to say herbal tea. Ooh how lovely! My favorite drink is white hot cocoa from Starbucks with fresh whipped cream. My favorite drink is a big hot cup of coffee... Thanks for the giveaway! My favorite is Trader Joes candy cane green tea. I bought 10 boxes to last me as long possible. My favorite seasonal drink is caramel apple cider! Most definitely! My favorite seasonal drink is real apple cider from the orchard. Any variation on apple cider is also delicious, especially hot spice cider. Fresh apple cider is one of the things I miss the most about upstate NY (and cider donuts too, of course!). Well, it feels like spring here in Arizona, so I'm all about sparkling lemonade right now! Yum. Starbucks Caramel-Apple Spice! I live off of it. i love hot chocolate with mini marshmellows and no whip cream! An extra cup of coffee this time of year! 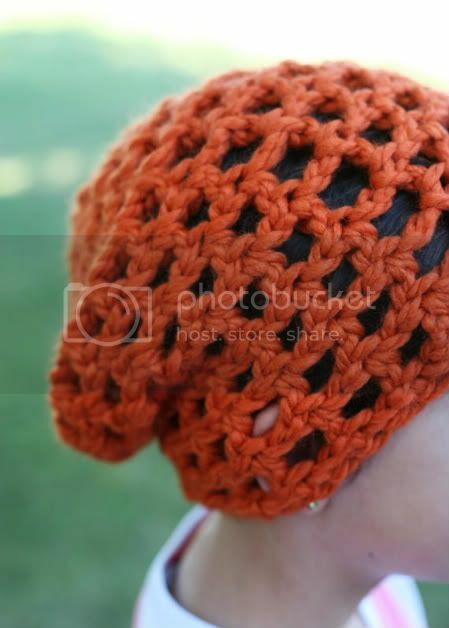 Okay 1st let me say I came acrosses that orange knitted hat in a blog and have been looking for it everywhere! So thanks now I know!! but I can't drink Coffee anymore so I found that at Coffee bean they add the Pumpkin flavor to a Pure Vanilla drink (which is like a Vanilla steamer) it is so good its now my new favorite! anything warm is perfect to sip after being out in the cold. my current favorite is lemon, ginger, and honey tea. it tastes like hot lemonade! I love a good dark chocolate mocha. I am in love with this giveaway! Seriously cute stuff. Hot chocolate with a splash of Bailey's! Yummy! 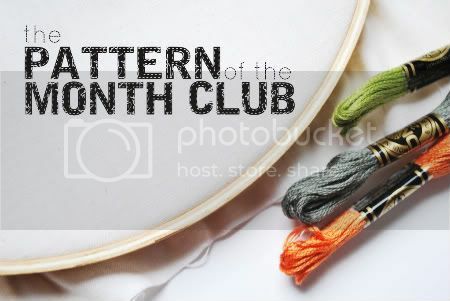 Loving that Pattern of the Month Club! I'm typically a black coffee drinker, but right now I'm loving a sweet honey vanilla latte! My favorite drink of the moment is soy vanilla lattes! Yummm. They are just delicious. Now that I'm thinking about it, I want one. ...Starbucks pumpkin spice latte. But, hey, it's great! So I won't apologize. In the summer: club soda with fresh lime juice. In the winter: chai latte from our local coffee shop, or wassail. I looooove hot chocolate when it's cold outside. So good! I love lemonade in the summer. Raspberry lemonade has my heart! I don't necessarily have a seasonal drink. It's Pepsi year round. I am gonna have to stick with the old favorite hot chocolate with tons of tiny marshmallows... YUM! I'm still stuck on pumpkin spice latte's!! Carmel Apple Cider is my favorite! My favorite drink is coffee...with a zillion variations. This past december I discovered that I love love love the Lucerne (Safeway) brand peppermint white chocolate creamer. YUM! When I went back for more...alas, the store had sold out. I tried other brands and they just weren't as tasty. You can bet I'll be stocking up on that next year! Today I'm seriously craving some caramel apple cider!!! I live for apple cider this time of year. Anything to warm me up in a Winnipeg winter. Hot chocolate with lots and lots of marshmallows!!! Salted caramel hot chocolate from Sbux!! Oooh, I love a nice warm white chocolate mocha latte when it's cold. YUMMY! I love a nice mug of homemade hot chocolate. Currently addicted to peppermint mochas and caramel apple spice from Starbucks. Pumpkin Spice Lattes from Starbucks, if I'm lucky I get to enjoy them from August-February. In the summer, I love some fresh squeezed lemonade, especially with strawberries in it! In the winter, I just can't resist a gingerbread latte from Starbucks! That's when they really get my business!!! Oh the choices! I love strawberry lemonade during the warmer months...and a warm carmel apple cider during the colder months. That's the ticket! I drink chocolate chai all year long, but it's best during fall weather and holiday season. I tried it once and now I'm hooked. We're pretty much best friends. On a cold day, I love to cozy up with steamy, creamy cup of spicy chai tea. A big hug and thanks to you and your awesome sponsors! In the winter I love a half-hot-chocolate-half-coffee from Dunkin Donuts. I love skinny hazelnut fraps in the summer! And ice cold, tart lemonade. Can it be any season? 'Cause come summertime I want a very specific beverage! And that's ice coffee from Frontside Grind in North Conway NH. They do their ice coffee with coffee ice cubes so it doesn't dilute as you drink it. SO simple. So brilliant. i'm mostly a water drinker, but I do love a cup of hot chocolate in the winter time. And I can definitely enjoy a glass of chai tea - warm in the winter months and iced in the summer months. I can't get enough chai tea lattes. It's my go-to pick-me-up! I love to drink chamomile tea with honey during the winter. i love me some hot apple cider when it's chilly out. My fav is Hot Chocolate. I love topping it with mini marshmallows or whipped topping if I have any on hand! Its anice treat at the end of the day! A nice cup of hot cocoa! Uh hellooooo hot chocolate! With little pockets of powder around the bottom to scrap out with a spoon! I would have to say that my favorite is hot coco with a ton of marshmallows. I think my dog bailey would agree, he's a marshmallow hog! jenngeology at gmail. My favorite would be a bowl of warm hot chocolate with a sprig of fresh mint. I love chai! In the winter a chai latte from starbucks, or even better a raspberry chai latte from a local cafe called Connecticut Muffin (in Brooklyn). In the summer, make it an iced chai and I'm good to go! I love coffee!!! Does coffee count? every year i look forward to the pumpkin spice lattes & then drink way too many of them. Because I am tired of this long winter, I will tell you my favorite spring/summer drink: Iced green tea, of course from Starbucks! So refreshing! My favorite seasonal drink is a chai tea latte.. seasonal because its just too hot in Texas to drink them in the summer! my favorite seasonal drink is hot chocolate. I am loving hot chocolate right now! It is so cold outside and I love sitting with a warm mug of hot chocolate. My favorite drink is either hot apple cider or hot chocolate. Yum! Thanks for the chance to win. Wow, all of those giveaways are lovely!! My favorite seasonal drink is a gingerbread latte. They just make me feel so cozy and nothing reminds me more of Christmas (the best holiday ever). a honey latte from the hub in springfield - any time of the year! I love lemon tea with honey! My new favorite seasonal drink is apple cider. I just tried it for the first time this year and I loved it! I love, love, love the Holiday Tea from Harney and Sons. It makes me feel so cozy. I'm a big fan of spiced cider! Stephens Peanut Butter Cup Hot Chocolate, yum! Apple Cider. mmm mmm soo good! Spiced cider is my absolute fav. My favorite drink for the winter season is a soy mocha with an extra shot of almond syrup. Yum! My go-to drink lately has been a hazelnut latte- yum! One seasonal favorite would be Ovaltine, I am very old fashion and cannot get enough it. Especially after a long day out in the snow! Wassail. Can't get enough of the stuff. I love a good cup of hot chocolate with whipped cream. Yum! Fave winter drink of this winter (as I am pregnant) is hot cocoa. I'm a BIG coffee drinker! My favorite drink for winter is a peppermint white mocha. It just feels like a warm cup of winter goodness! Love apple cider when it's cold out. I go straight for the Chai Latte. It is sweet and spicey at the same time. What more good a gal want. Hot chocolate...to be specific, salted peanut butter hot chocolate from the Shake Shack, NYC!